We’d love your help. 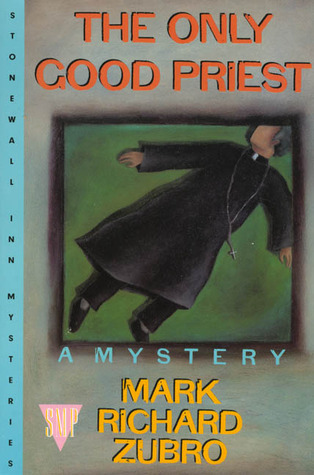 Let us know what’s wrong with this preview of The Only Good Priest by Mark Richard Zubro. Father Sebastian, the only good priest everybody knows, is dead. Pastor of a parish outside Chicago, Father Sebastian was also involved in the gay community through his work with Faith, the gay Catholic organization the diocese is trying to drive out of the church. High school teacher Tom mason, who has gained some local notoriety from his involvement in a couple of murder Father Sebastian, the only good priest everybody knows, is dead. Pastor of a parish outside Chicago, Father Sebastian was also involved in the gay community through his work with Faith, the gay Catholic organization the diocese is trying to drive out of the church. High school teacher Tom mason, who has gained some local notoriety from his involvement in a couple of murder cases, is asked by friends to look into the priest's death; was it murder? Along with his lover Scott Carpenter, a professional baseball player, Tom plunges into ecclesiastical intrigues, the hidden underground of gay Chicago and the tragedies caused by a hypocritical church. To ask other readers questions about The Only Good Priest, please sign up. First two centered around school and less sophisticated, don't get me wrong they had twists just like this one. Maybe it was the suspects that were more engaging. Although I didn't care much for the terrorist aspect, they seemed to have little redeeming qualities . He tried but they seemed two generic. The ending. As always was a surprise. Tom and Scott are once again on the hunt for a murderer and this one has everything but the kitchen sink tossed in. Scott came out to his family in the last book. He parent are due to arrive from Alabama in few days to meet Tom. Tom's teachers' union is on strike and, and he has to walk the picket line. An HIV positive priest who held weekly services for the LGBT community dies. Tom & Scott investigate. The church and the police both insist it wasn't a murder, cover up the crime and threatened T Tom and Scott are once again on the hunt for a murderer and this one has everything but the kitchen sink tossed in. The church and the police both insist it wasn't a murder, cover up the crime and threatened Tom and Scott. Toss in a radical lesbian hate group, a rent boy, a kidnapping, and a few broken ribs and you have a typical Tom & Scott murder mystery. This third book of the series was just OK - definitely not as good as the first two. Too much running around and difficult to keep track of. The best bit was the introduction of Scott's family who had up till now rejected him for his being gay but apparently seem to have come to a reluctant acceptance - maybe we will see more of this relationship in subsequent books. There was a lot of running around and characters but it wasn't as enjoyable as the other two books.